For this trip, you can enjoy a long, relaxed breakfast and still be back in your Corissia Hotel in time for dinner. You shouldn't go on a Monday, as the excavation site at Aptera is closed. The tour is also enjoyable for younger children, as it's only a short drive between destinations and there's plenty to see and do at each stop. It's only this century that systematic excavations have unearthed an ancient theatre of particular beauty in Aptera. The two enormous cisterns from Roman times are just as impressive. 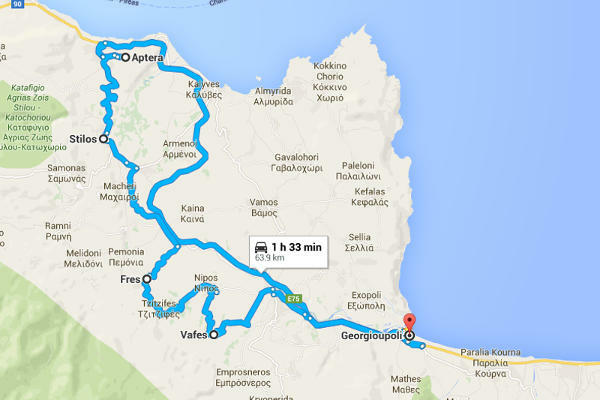 First take the National Road towards Chania until the turn off for Aptera. The road is in good condition and winds its way briefly up the mountain, reaching the modern village of Aptera with three tavernas and cafés. Turn left and head uphill after the particularly lovely 'Kafeneion 1912'. After 1,300 m you will see a grey panel in front of ancient ruins on the right-hand side of the road. It depicts the layout of the ancient city of Aptera. Approximately 15 m away you will see the walls of the ancient city gate, which have been partly rebuilt. They stand beside an uphill dirt track, where remains of the ancient road have been preserved. The course of the ancient city walls is marked in yellow on the grey panel. Another panel between the road and the city gate displays a reconstruction drawing and photos showing how the area looked before and after the excavations in 2010-2012. The reconstruction drawing of an ancient catapult as used by those laying siege is also displayed. 300 m further on, you will reach a fork in the road on the expansive rocky plateau, which is about 200 m high. Giant fennel flourishes here in large numbers. First drive to the left. The narrow road ends after 800 m in front of Koules Fortress. With its two round turrets, it almost looks like a Playmobil castle. It was built as late as 1860 by the Turks, meaning it stems from the Late Ottoman period. Although visitors are not allowed to go inside, the view from up here across the sea and the Apokoronas peninsula is fantastic. Afterwards, go back 800 m to the fork in the road and now turn off to the left. Only 200 m further on, you will arrive at the small entry booth to the excavations of the ancient city of Aptera. You should take at least 80 minutes to walk around here. For 2000 years, the people of the ancient city of Aptera (emphasis on the first "a") lived on a high rocky plateau, about 1000 m long and approximately 200 m high. Today it is south of the National Road from Georgioupolis to Chania. People began to settle here as early as 1300 B.C. and in the 4th century B.C. they minted their own coins. In the 7th century A.D. the settlement fell in the period of Arab raids. Monks from the island of Patmos founded a monastery between the ancient ruins in 1181, which was inhabited in both the Venetian and the Ottoman period, and only abandoned in 1964. Finally, the Ottomans erected a small fortress here on the edge of the rocky plateau, 1866-1869, which is also clearly visible from the National Road. It's only this century that systematic excavations have unearthed, among much more, an ancient theatre of particular beauty. The two enormous cisterns from Roman times are just as impressive. The courtyard of the old monastery is a great place to sit, draw and paint, sunbathe and have a picnic. Just after the entrance lie the foundation walls of a small bipartite temple from the 5th century B.C. below street level, which German archaeologists had already unearthed in 1942, during the Second World War. It's not known which gods were worshipped here. Just after, you will enter the inner courtyard of the monastery. A small gate opposite takes you into the excavation site. You will enter the 'vaulted cisterns', a cistern of monumental dimensions from the 2nd century. You can go partway inside the high vaults of this giant water reservoir. Afterwards, the circuit takes you past nature at its best to the walls of the thermal baths, which have been preserved at an impressive height. This was a bath house from Roman times, where citizens pampered themselves in their free time. Head through the courtyard of the monastery and you will find yourself back at the entrance. Take a short walk to your right, along the outside of the fence, and you will get a good view of another monumental Roman cistern, which no longer has its roof. It is in the form of the Greek letter, gamma. A broad path about 150 m long leads off left of the entry booth, taking you to the city's ancient theatre. It was originally designed in the 3rd century B.C., then modified in the 2nd half of the 1st century, and again in the 3rd century. Its upper seating tiers and the surrounding meadows are covered with thousands of red poppy flowers in April. The tiers and the stage-building were built from local limestone. At the beginning of the 20th century, a kiln was erected in the orchestra, the round "stage", which burned lime from the ancient seats and stone blocks in the walls. In this century, archaeologists have reconstructed many of the former seating rows from the same stone, and also used tools similar to those they would have had in antiquity. Today, the theatre appears relatively intact. The reconstruction work was financed with support from the EU. Advice for Mondays: if you visit Aptera on a Monday, you don't need to do without a view of the theatre. Simply walk along the fence from the entry booth anticlockwise. After about 200 m you will have a good view of the theatre over the fence and can take some photographs. Afterwards, drive back down to the modern village of Aptera, and stop off for a while in Kafeneion 1912. The landlord is happy to show you the old black and white photo of his grandparents on the dining room wall, who founded the coffee house in the year it is named after. The tables in the kafenion stand under two mulberry trees on the tarmac. The villager's blue post boxes on the roadside certainly make for an unusual photo: this is where the post is delivered, whilst the yellow post box in between is where post is simultaneously collected from. Now follow the blue sign towards Stilos. 200 m after the turn off to Malaxa, there is a road on your left with a faded sign, which draws your attention to the 'Late Minoan Tomb of Stylos'. This Late Minoan tomb lies in an olive grove behind a locked gate; however, the key is usually left in the lock! But it's only really worth going inside if you are particularly interested in archaeology. 400 m further down the road, you will see a green canopy to the left, about 80 m away on the hill. It protects vestiges of a Minoan kiln from the 14th century B.C. 1200 m further on, a wayside shrine is to the left of the road, and just after that down in the valley you can already see the crossed-dome plan church of the Panagia Serviotissa from around 1100, a solid 11 m long and 9 m wide. Follow the road another 200 m to a small junction. A brown sign to the left with the words 'Panagia' points you to the church, about 650 m away. A narrow asphalt road takes you to this medieval place of worship, set between orange and olive trees. The key is always in the door. Inside, the church is fairly plain. The floor is covered in gravel, but the three considerably high vaults and the high dome are impressive. The latter is mounted on an octagonal tambour which is unique for Crete. It once belonged to a monastery that monks from the holy island of Patmos founded as far back as 1088. It's long since been abandoned, but some of the villagers in the surrounding area still come here occasionally to light candles or oil lamps, pray in front of the cheap printed icons and even to hang up small votive tablets to support their prayers in eternity. Back on the main road, you will enter the village of Stilos after 900 m. To the left, you will see a large industrial site. This is where 'Samaria' table water is sourced and bottled. On the other side of the street you will see a small, medieval double church. A brown sign tells you whom it is dedicated to: Ayios Ioannis Theologos, the writer of the Book of Revelation in the Bible. It dates back to the 13th century. You can still discern three niches on the most southerly of the three apses, where brightly coloured ceramic plates once served as decoration. The church is open, pigeons fly in and out. In the southern part of the double church, you can still make out the remains of some frescos in the apse; in the northern part, archaeologists have uncovered the remains of an even older church beneath the floor of the current one. In the back left-hand corner of the churchyard between a cypress tree and an olive tree lies a mysterious large piece of rock: there appear to be 13 ribs and the spine of a large mammal fossilised inside. 200 m further down the main road, you will reach the shaded Platia of Stilos. The eight water fountains here are fed by the village springs. Tables and chairs from the simple rural tavernas sit under numerous old plane trees and eucalyptus trees. You can have a good lunch here, if you don't want to picnic at the next stop. Our daytrip now takes you through the villages of Neochorio and Agioi Pantes, and on to Fres. Head to the Platia here, with the church, town hall and several kafenia. Drive through the arched gateway beside the town hall to the signposted Panagia ton dion vrachon. The little street continues for 1 solid km, ending in a car park in a narrow valley. On one side you will see a mandra, a typical enclosure for sheep and goats. On the other, the villagers and friends of Fres created a wonderful little pristine rock garden in 1999 'in memory of their dead'. A short path winds through it to a small church dedicated to the Virgin, set on a low rocky outcrop. Beneath the little church, a secluded spot with long tables and benches awaits you, where the locals celebrate the consecration of the church once a year. Here you can enjoy your own little picnic at any time, whether in the shade or in the sunshine. Many small plants grow out of the rocky outcrop; in the rock garden, roses and oleander, prickly pears and sisal, ivy, figs, wisteria and olive trees flourish. A sign admonishes you to take care of nature: 'This little forest is yours. Show it your love!' is written on it in Greek. It's now about another 8 km to the last stop on this tour. You will arrive in Vafes via Tzitzifies. Follow the brown signs there to Kalamato Cave, Krionerida's Cave and St. Ioannis Erimitis. They take you to a car park at the end of the small, narrow Krionerida Gorge. A narrow but easily accessible path takes you through the lush green gorge, offering plenty of shade, where a striking amount of arum flourishes. Past the entrance to Kalamato Cave, it's about 10 minutes' walk to Krionerida's Cave. In the entrance you will see several skulls and human bones in an old glass shrine. They commemorate the fact that on the 9th August 1821, Ottoman troops murdered approximately 130 Cretan men, women and children here who had hidden in this cave. Shortly afterwards, you will reach Vrisses, and will be back in your Corissia Hotel no more than 10 minutes later. You probably still even have time for a quick dip in the sea.